Trump’s new strategy for Afghanistan hits many of the notes that Afghans would have liked to hear. After more than six months of consultation, U.S. President Donald J. Trump has finally revealed an Afghan strategy that brings the whole of the region near Afghanistan under its canopy. Unlike previous U.S. administrations’ Afghan strategies that were based mostly mere on rhetoric, President Trump’s strategy was long overdue from an Afghan standpoint and seems quite clear and pragmatic in terms of meeting its ends, if implemented in its true essence. It is something that the Afghans have been waiting for for over a decade. One of the most important aspects of this new U.S. strategy is that it almost aligns with the Afghan government’s policy perfectly. Trump stated that the U.S. will continue supporting the Afghan government in terms of bringing necessary reforms and tackling corruption. On the internal front, Afghan President Ashraf Ghani seems very committed in bringing about reforms in the government, particularly in the security institutions. He also intends to fight corruption. Trump’s speech definitely boosts his efforts of weeding out the corrupt elites and warlords. On external front, the Afghan government has been advocating that Afghanistan is victim of state-sponsored terrorism. Ghani has raised this point repeatedly that Pakistan has unleashed an “undeclared war of aggression” against Afghanistan as it subsidize a resilient insurgency. The new U.S administration finally seems to be convinced that Pakistan is, in fact, subsidizing the Afghan Taliban. Trump stated that “Pakistan often gives safe havens to agents of chaos, violence, and terror.” His message to Pakistan is quite clear and resonates with President Bush’s message to Pakistan prior to the Afghan invasion: “You are either with us or against us.” Though U.S. administrations have always taken a hard stance against Pakistan at some points, however, actions not rhetoric will make distinction between President Trump’s stance and those of his predecessors. One major country that Trump didn’t talk about in the new Afghan and South Asian strategy is Iran. Iran has recently started following the footsteps of Pakistan by equipping and sponsoring the Taliban insurgency across Afghanistan. Previous strategies failed as they ignored dealing with the root cause of the problems. In one of my recent pieces, I argued that “any strategy that doesn’t deal with Pakistan is not a strategy that will bear fruit. Killing each mosquito individually and ignoring its pond is not solution.” Ignoring the role Iran can and will play definitely undermine Afghan, the U.S., and international community efforts in the fight against radicals and extremist groups in Afghanistan and in the region is shortsighted. Though the strategy seems to be very comprehensive in terms of dealing with the overall situation in Afghanistan and the region, it is important to answer the question of how it can be operationalized. Dealing with Pakistan appears to be a hard question to answer as the U.S. is logistically dependent on Pakistan to carry out its operations in Afghanistan. However, this requires a multi-pronged approach and should be tailored to coerce Pakistan to give up its support for insurgents and to stop using terror as an instrument of foreign policy. Both Afghanistan and the U.S will achieve an “honorable and enduring outcome” to the Afghan conflict if the Afghan administration under Ghani continues to purge corruption, initiate and speed up a wide range of reforms in the government, and, by the same token, the U.S. continues supporting Afghan security forces. In the meantime, on the external front, the U.S. must continue taking strong action against Pakistan to eventually force it to change its policy towards Afghanistan. Aziz Amin Ahmadzai writes on political and security in South and Middle East. He is a Chevening Scholar and a former Afghan government official. He tweets @azizamin786. 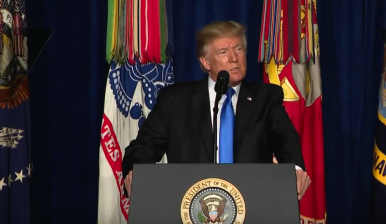 U.S. President Donald J. Trump's plan for Afghanistan leaves several open questions. 5 Strategic Priorities in Afghanistan That Donald Trump Should Consider Before the NATO SummitWhat Afghans Expect From Donald TrumpWhy Is Zalmay Khalilzad Such a Controversial Figure in Afghanistan?Taliban Killed 33 Troops, Police in HelmandUS-Taliban Talks: What's on the Agenda in Doha?